(Background on how to read the post: [as can be seen in the comments section to a reader] I was hoping to highlight how certain false information, through propaganda and etc, can be constructed to become a Truth, or in cases of irrelevant information can be prioritized. The post was meant more to explore the CCPs construction of truth-making on Tibet and also anyone who writes on Tibet in either creating a Truth or prioritizing certain truths, in order to, or shy away from, emphasizing the political Truth of Tibet. Mao is famously known for the above quote. How are certain “truths/knowledges/facts” created? A lie can be turned into the truth so long as you repeated it, according to Mao, a hundred times. The discussion then is not, and it never was, about what the truth is, but whose truth triumphs over the other. So then the question becomes, how is a truth constructed in the first place? Usually the administrators do not censor comments so long as they’re not spam or hate comment based on race/gender/class/creed etc. Both Anonymous & Dawa seems to be the same person and the IP address traces this person to be in Miami, Florida. Tenzrn’s IP traces to Seoul, South Korea. Yokham’s IP traces to Toronto, Ontario-Canada. Although Tenzrn and Yokham’s IP addresses trace to two different countries, interestingly, yokham made his/her comment 6 minutes after Tenzrn. Not to mention the similarities in the writing styles. So what does this say about these, or same, individual/s? It is clear that this person/s is trying to inject this information as truth, and hoping the administrators would publish it to further disseminate this information in the cyber world in the hopes to possibly turn this information into a Fact or Truth. Why then, am I publishing this person/s comments when I could have easily marked it as spam and delete it? Why give this comment some airtime? 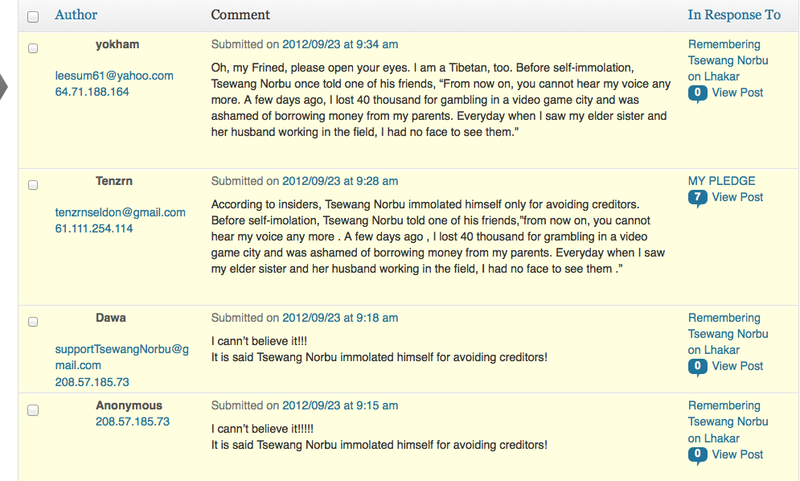 While looking over this and noticing the weirdness and irrelevantness of the commenters information, it made me think about how this person/s had actually tried to disseminate a random comment in a now popular blog (at least I think LD has become popular) read by young Tibetans, in an attempt to construct a truth. Whether the content of the comment about Tsewang Norbu is true or false is clearly irrelevant to his immolation that led to his death. What’s important however, is the attempt by these comments to change/minimize our views of Tsewang Norbu and to construct a new cultural behavior/feel/truth to how we as Tibetans should view him. It’s an attempt to reframe his personhood in a negative light. To produce a new truth, a tainted one, to reconstruct the narrative on Tsewang Norbu from that of positive to negative and to diminish the significance for what he stood for when he immolated. This is a good expose. Am sure you’ve heard of the 50-cent army (Wu mao dang) in China. They’re prolific and effective. Rebecca MacKinnon (through her blog RConversation), Michael Anti, China Digital Times and China Media Project, have all been exposing the activities of this army and other fully paid armies monitoring the Internet from China. Thanks for the comment. I have heard and read previous articles by some of the people you mentioned on the 50-cent. Glad you brought it up. It’s good to highlight others who have written on the subject. I guess this came off as an expose, but my point wasn’t necessarily the 50-cent army. I was hoping to highlight how certain false information, through propaganda and etc, can be constructed to become a Truth, or in cases of irrelevant information can be prioritized. The post was meant more to explore the CCPs construction of truth-making on Tibet and also anyone who writes on Tibet in either creating a Truth or prioritizing certain truths, in order to, or shy away from, emphasizing the political Truth of Tibet. Which then creates a certain cultural norm, within the scholarship or anything on Tibet, of what “truth” to follow. Right now, the hot topic that overshadows all seems to be the Environment and/or development. The problem isn’t environment or development as the subject, in fact it’s important, but it becomes a problem when it’s used to directly and indirectly shut down all discussions on Tibet that aren’t all somehow related to the environment or development and etc. You are absolutely right, of course. It is great to see the amount of attention being paid to Tibet and Chinese propaganda by both Tibetans and others (such as Robbie Barnett and Dibyesh Anand). There is insufficient attention from among Chinese people who think independently of the CCP line (apart from Woeser-Wang Lixiong and perhaps a few others). Hope that can change.